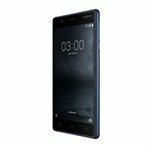 Nokia 3 delivers unheard of build quality to the affordable smartphone segment. It is constructed from a precision machined aluminium frame that brings great feel and durability against knocks of everyday life.The 5” HD screen comes wrapped in sculpted Gorilla Glass for protection and feel. It is also laminated and polarised so it is bright and clear with excellent visibility in sunlight. 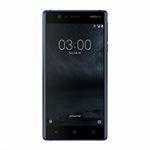 Nokia 3 comes with 8MP, f/2 cameras with a large pixel size on both sides, so no matter if it’s a scenic image or selfie you’re after, Nokia 3 can do both with no compromise. And thanks to the in-built gyroscope, it is ideal for making those perfect panoramic memories.With Nokia 3 you get an Android that is pure, secure and up to date. It’s clean and clutter free, ready for you to customize. We’ll even support monthly software updates to help keep you secure while enjoying the freshest new features. The easiest way to keep your earbuds and headsets tangle-free. One end of your cord fits through the hole at the base, wrap your cord around the middle and clip the other end at the top. Convenient s-Biner attachment so you can keep it close at hand clipped to anything from a zipper to a purse. Cord management tool for your earbuds.